It’s July 2014 and Jed Selby is trying to share his dream with a skeptical visitor. He’s bounding across pastures, pointing everywhere. Trails right here, under the old growth cottonwoods. A footbridge over the meandering Cottonwood Creek. Terraced seating here. Maybe a huge walk-up bar. Camping on this ridge. And this field, the sprawling 80-acre pasture of dirt and rocks in the shadow of Mt. Princeton, this will be the main stage. “Twenty-five thousand people, dancing right here. Can you see it?” Selby says. But then Selby has always seen things other people can’t. When he and his sister Katie bought the Buena Vista town dump on the Arkansas River a dozen years ago, it was a 41-acre pile of bullet-blasted bottles and rusty rubble. But Selby saw 500 homes, tightly clustered around pocket parks. He saw a pair of hotels and a restaurant with a deck overlooking kayaker-filled waves in the river and a stage-anchored central park capable of hosting a few thousand people. He saw a thriving arts community, with sculptors and painters living in loft apartments above their well-trafficked studios. It was a bold vision for a pro kayaker on the tail end of a young man’s career. But he had confidence in his intuition, a common characteristic of class-V kayakers who navigate rowdy whitewater with a grin. He knew Buena Vista was special. He knew it had potential. Fast forward a dozen years and Selby’s South Main has more than 50 sustainably built, stoop-gabled buildings and families are lining up for the next round of homesites he plans to offer. The acclaimed New Urbanism developer travels across the country helping other communities design riverparks and spark pedestrian-friendly communities. 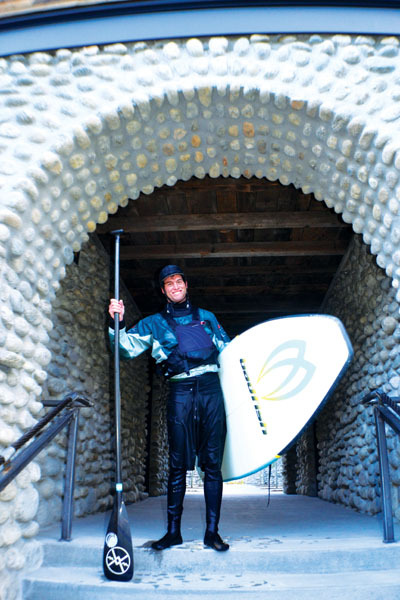 His 20-room, cobblestoned Surf Chateau ranks as one of the coolest riverside lodges in the state. He’s broken ground on a larger riverside hotel, where he is planning a 300-person music venue with a top-of-the-line audio system. He’s erected permanent affordable housing in town, using FEMA cottages deployed after Katrina ravaged the Gulf Coast. There’s more. Selby has joined AEG and Boulder-based booking and management agency Madison House Presents in hosting what they hope will become an annual festival for the next 20 years on the 274-acre ranch. Launching in August with Odesza, Alabama Shakes and Trey Ansatasio headlining, the Vertex Festival expects to lure 20,000 camping concertgoers with an eclectic mix of bands. Both Selby and the promoters are sculpting the festival into Colorado’s Coachella. “He does like to dream big,” says Seth Roberts, an organic farmer whose Weathervane Farm grows 142 varieties of vegetables and herbs on a portion of the Selby property. It’s not just that Selby dreams big, but he has a near perfect track record of bringing those dreams to fruition. Selby’s dad, Buzz, a dentist with a swath of commercial real estate in downtown Tucson, Arizona, also remembers walking the ranch in 2013. His son, along with his daughter Katie, wanted to buy the place. A bank was selling it after a previous developer had spent years fighting for annexation and local approval to develop as many as 715 homes. Buzz liked the property. It’s hard not to, with its ambling creek, ample water and series of meadows sprawled beneath the looming Collegiate Peaks. “I was just blown away. This truly is one of the most beautiful sites anywhere,” he said. But as a businessman, he was wary. A previous developer had nearly lost everything fighting for several years to develop the ranch into a community. The battle to develop had riled the town, with two contentious votes and lawsuits. The Selbys knew they couldn’t propose another community in Buena Vista, especially since they had hundreds of homes planned at South Main. But they wanted to preserve the ranch. Buzz thought his son must be joking when he suggested that this particular property would make an excellent festival venue. That was actually the initial thought that hit Selby when he first toured the property in early 2013 and began scheming a way to buy it and preserve it. A week after that stroll with Buzz, Selby had the executives from AEG and Madison House touring the property. They were impressed with both the property and the soon-to-be owner. Months after closing on the property, Selby was captaining heavy machinery clearing rocks, grading the pastures and seeding. He would show his pals live video on his phone. He bragged about his Wifi-enabled pivot irrigation system soaking the pastures. 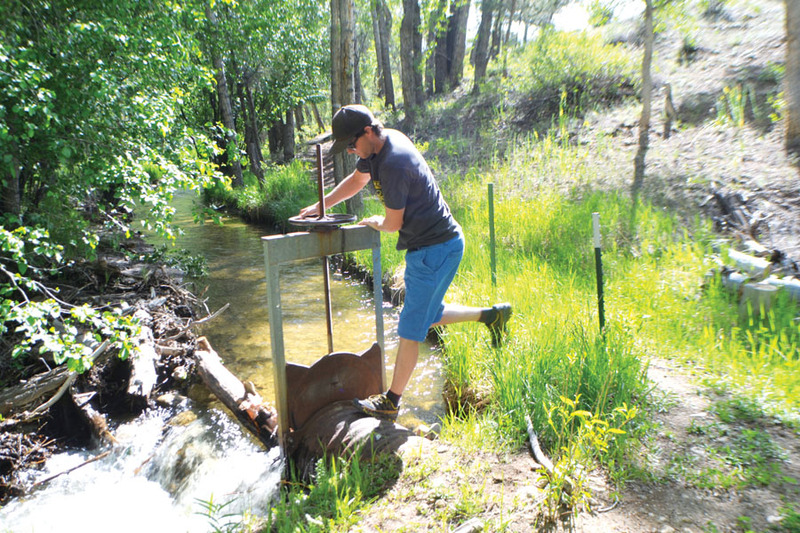 He spent months clearing clogged irrigation ditches and diversion boxes across the property. Within a year-and-a-half, the trashed plateaus and pastures were transformed into lush meadows of green grass—perfect for flip-flopped dancers and tent-dwelling campers. All that work transforming the venue came well before Selby inked the deal to create Vertex. But Selby knew that if he waited until he secured a festival promoter, it would take almost two years to prep the ranch for a party. So he started work immediately after buying the ranch, with a lot of help from his dad. “That was a pretty big leap of faith,” Selby says. But what Selby learned early is that a really good festival site also is a really good farm. If you can prod strong hay growth, it creates lush, resilient grasses for camping and dancing. And each time the promoter team visited the site, it was a step closer to being ready. That’s what enabled Madison House and Selby to host a festival mere months after negotiating a deal. The Vertex Festival will mark yet another jewel in Selby’s crown of achievements. Kayak champion. Developer. Hotelier. Festival host. It hasn’t been an easy road. The first year he went pro in freestyle kayaking, he never made a finals round. It took him almost a decade to make South Main viable, after weathering a recession that broke countless real estate entrepreneurs. But he never let go. Like a Gila monster. “If I truly believe it’s the right thing to do, I will do everything it takes to make it happen,” he says. Jason Blevins writes for The Denver Post. He is a strange dancer, but that has never stopped him.